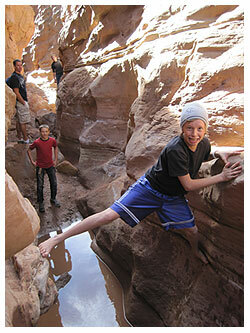 Last weekend was our monthly scout outing and annual trip to Goblin Valley. With it being our third year to carry out this tradition, the boys look forward to it with great anticipation. Thinking back on our previous trips, we did the Little Wild Horse and Bell Canyon loop the first year. The second year we experienced Ding and Dang Canyons. 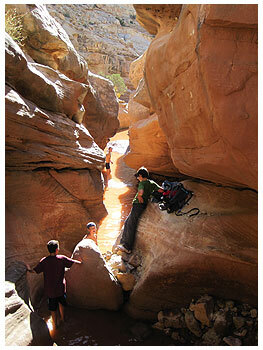 This year, we wanted to see more of what lies within the San Rafael Swell so we decided to explore Crack Canyon. We thought about making this a loop with the neighboring slot, Chute Canyon, but the estimated 14-mile combined route was too much for the short amount of time we had. We also needed to allow time for exploration among the hoodoos in Goblin Valley State Park since a few boys had never been before. 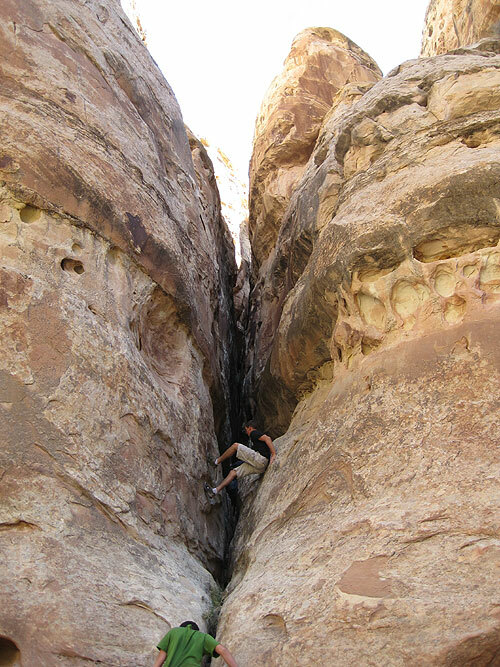 Crack Canyon was a fun experience… It had a section that resembled Little Wild Horse as well as an obstacle or two that reminded me of Dang Canyon. This canyon has a section of “subway” that was cool, although I can’t compare it to the real Subway in Zion’s National Park (which I hope to do someday). The obstacle everyone warns about called “the Slide” did resemble a smooth playground slide with the bottom half broken off and dry ground below, but it was nothing too difficult to crawl back up. A few steps beyond that was another short drop, but this time into a waist-deep pool of water (pictured above). For the taller/stronger boys, they were able to bridge across that water obstacle with no problem. For others, it was either a lizard-like crawl across the wall or a wet wading experience. Either way, everyone has their own story to tell now. The last obstacle was a much longer pool of water where neither bridging nor stemming was an option (pictured below). The boys who were already wet just jumped in and walked through, while the rest of us back-tracked a little and found a route up and around this water hazard. We did see Cracked Window along the way and crawled through a few tight side cracks in this canyon. Since we weren’t doing a loop this time, we just turned around when the canyon widened and started to get less interesting. 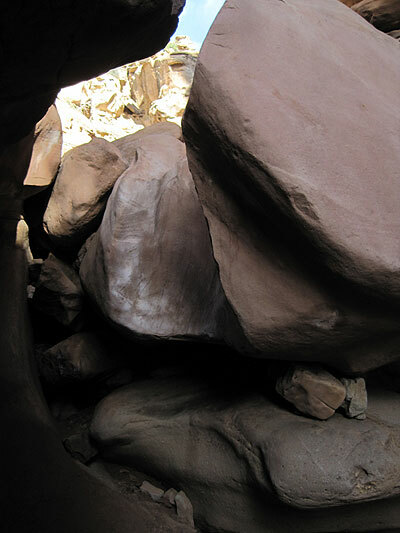 If you are planning a first-time trip to explore slot canyons in Goblin Valley, I’d strongly suggest Little Wild Horse. It is the least technical, yet most dramatic with its sections of tall narrow walls and tight twisty passages. I think it’s also the most kid-friendly experience you will find that also gives the boys a strong taste for how fun canyoneering can be. 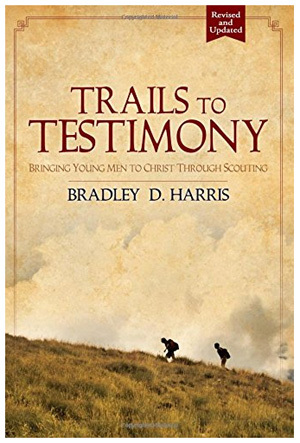 If you are taking older kids, like Varsity Scouts, I’d suggest Ding and Dang Canyons that offers different drama and more physical challenge to the outing. 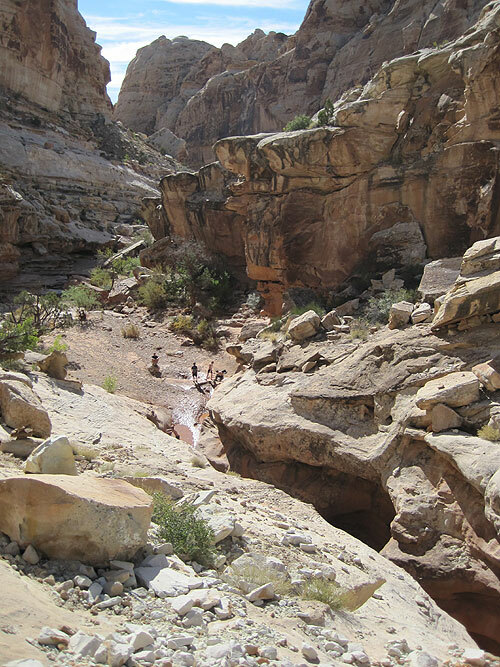 Our boys had a great time in Crack Canyon and the leaders found some new adventure too since we’ve been to all these other slots several times. As we already start thinking about plans for next year, I’m not sure if we will try Chute or go back to Little Wild Horse. Here’s another Google Earth file of this route with waypoints to help you navigate Crack Canyon in the San Rafael Swell. 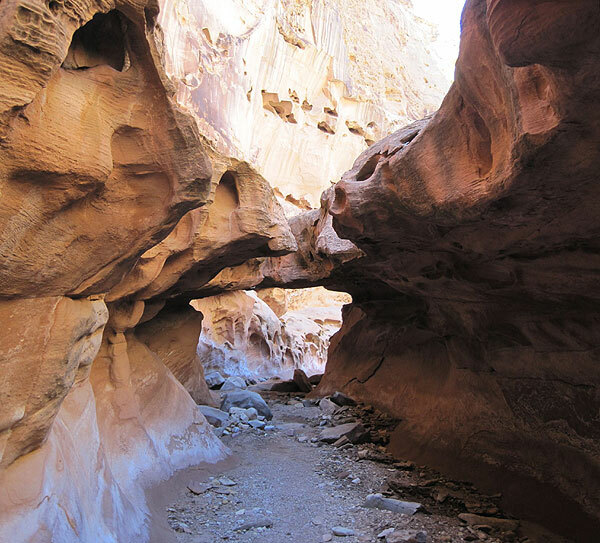 This entry was posted in Canyoneering, Hiking and tagged bell canyon, boy scouts, canyoneering, chute canyon, crack canyon, dang canyon, ding canyon, goblin valley, hoodoos, little wild horse canyon, san rafael swell. Bookmark the permalink.